AC-ClarettOctoPre 8-channel 24-bit / 192kHz A-D and D-A with eight Microphone Preamplifiers, and eight line outputs, for expanding computer audio interfaces via ADAT I/O. 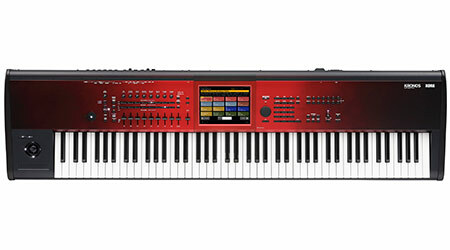 AC-MOSC0015 Second generation 18 in / 20 out USB 2.0 audio interface with eight Scarlett Mic preamps, 24bit/192kHz, eight ADAT inputs, eight line outputs, two main monitor outputs and two headphone outputs. Recording Software Included. Mac/PC compatible. AC-MOSC0018 Second generation 18 in / 8 out USB 2.0 Audio interface with four Scarlett Mic preamps, 24bit/192kHz, eight ADAT inputs, four line inputs, two main monitor outputs and two headphone outputs. 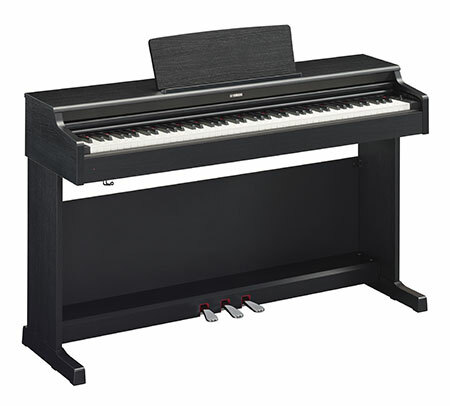 Recording software included. Mac / PC compatible. 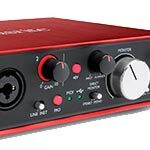 AC-MOSC0016 Second generation 6 in / 6 out USB 2.0 Audio interface with two Scarlett Mic/Instrument preamplifiers, 24bit/192kHz, two line outputs and two headphone outputs. Software and sample pack included. Mac / PC compatible. 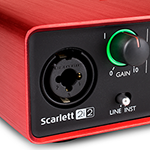 AC-MOSC0012 Focusrite Scarlett 2i2 2nd generation USB Audio Interface. High quality audio recording bundled with free software including Ableton Live Lite, Red 2/3 Plugins and free bonus plugins. AC-MOSC0014 Second generation 2 in / 4 out USB 2.0 Audio interface with two Scarlett Mic/Instrument preamplifiers, 24bit/192kHz, USB Bus Power. Pro Tools | First & Ableton Live Lite recording software, plug-ins and samples included. Mac & PC compatible. AC-MOIS0002 Focusrite iTrack Pocket lets you record HD video and audio direct to your iPhone 5 from a guitar or other audio source. Built-in mics or direct jack socket make recording a breeze and the free Impact App allows you to create then upload your creations directly to youtube. 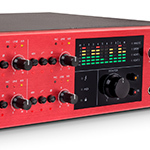 AC-Clarett4 18 In - 8 Out Thunderbolt Audio Interface with 24bit 192kHZ quality, pre-amp modelled on classic ISA design, 4 front mount direct inputs and super low latency under 1ms. 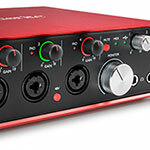 AC-Clarett2 The 10-in, 4-out Clarett 2Pre Thunderbolt interface has been designed for the discerning Singer Songwriter. 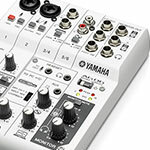 It combines two mic preamps, class-leading digital conversion and extra-low round - trip latency - enabling DAW plugins to be used while monitoring recordings. 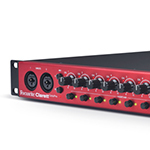 Clarett`s mic pre offers superbly low noise and distortion, plus the Air effect that models the sound of Focusrite`s renowned ISA transformer-based preamps. 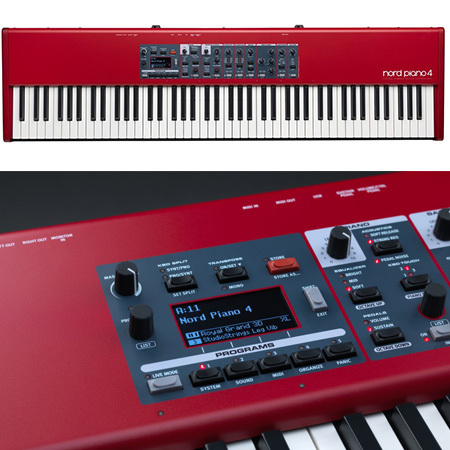 Complete with Focusrite`s precision 24/192 conversion offering up to 119dB real-world dynamic range, there`s never been a better, faster or easier way of getting your sound into or out of a DAW. 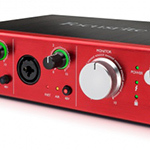 AC-MOSF0017 Focusrite Saffire Pro26 Audio Interface with free VRM Box limited offer. 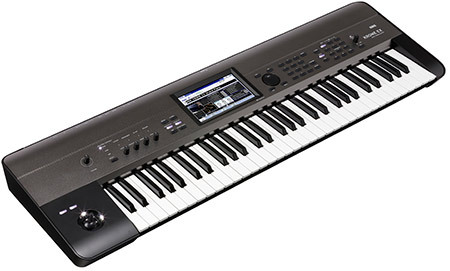 Thunderbolt compatible, up to 18in/8 outputs, 24bit recording for professional quality recordings. AC-MOIS0004 Focusrite iTrack Dock, integrated recording interface for iPad. Designed for any iPad with Lightning connector. Award winning mic pre-amps and USB powered hub for additional USB controllers. 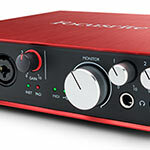 AC-OctopreMKII Expand your recording potential with the Focusrite Octopre MKII and 8 Channels of award winning audio quality inputs to add to your DAW system. 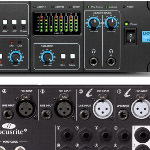 AC-FFLiquid56 The Focusrite Liquid Saffire 56 interface combines Saffire Pro and liquid technologies in a powerful 2u rack unit. 28 in 28 out with 2 liquid and 6 saffire pre-amps.